It's been a while now since I updated, we have been very busy with school stuff & then we had the boy's Halloween party last weekend. Since then I luckily have had some time to create, so using a method of making my own Glimmer Mist sent to me by my friend Irma, I made some christmas tags. 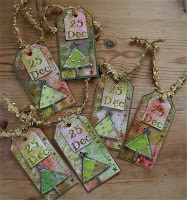 Sadly as with previous posts you can't see the glimmer & sparkle that these tags have but they still look pretty anyway. They are just done on some card that has been coloured with Distress Inks & some stamped images. Anyway I hope you like them, I loved them so much I have started making some using different colours & combinations, so look out for those over the next few days. These are lovely Robyn. They'll look great on your Christmas pressies. Oooh, oooh, bright idea!.... they'd look great decorating a Christmas tree too!